Kang the Conqueror is a fictional supervillain appearing in American comic books published by Marvel Comics. A time traveler, several alternate versions of Kang have appeared throughout Marvel's titles over the years, including his future self Immortus and a young heroic character named Iron Lad. In 2009, Kang was ranked as IGN's 65th Greatest Comic Book Villain of All Time. Kang first appeared in The Avengers #8 (Sep. 1964), and was created by writer Stan Lee and artist Jack Kirby. Rama-Tut first appeared in Fantastic Four #19 (Oct. 1963). Nathaniel Richards, a 31st-century scholar and possible descendant of Reed Richards, becomes fascinated with history and discovers the time travel technology created by Victor von Doom. Richards then travels back in time to ancient Egypt aboard a Sphinx-shaped timeship and becomes the Pharaoh Rama-Tut, with plans to claim En Sabah Nur—the mutant destined to become Apocalypse—as his heir. Rama-Tut's rule is cut short when he is defeated by the time-displaced Fantastic Four. An embittered Richards travels forward to the 20th century, where he meets Doctor Doom, who he believes might be his ancestor. He later designs armor based on Doom's and, calling himself the Scarlet Centurion, pits the Avengers team against alternate-reality counterparts. He plans to dispose of all of them, but the Avengers manage to force him from the timeline. Richards then tries to return to the 31st century, but overshoots by a thousand years, discovering a war-torn Earth that uses advanced weapons they no longer understand. He finds it simple to conquer the planet, expanding his dominion throughout the galaxy, and reinvents himself as Kang the Conqueror. But this future world is dying, and so he decides to take over an earlier, more fertile Earth. On Richards' first foray into the 20th century under the Kang identity, he meets and battles the Avengers, capturing everyone but the Wasp and Rick Jones, and informs the world that they have 24 hours to surrender to him. Jones and some friends pretend they want to help Kang, but double-cross him once they gain access to his ship, and the Avengers are freed. In an attempt to stop them, Kang releases radiation that only beings from his time are immune to, but Thor uses his hammer to absorb the rays and send them back at the warlord so even he cannot withstand it, and he is forced to escape. He later attempts to defeat the Avengers using a Spider-Man robot, but the real Spider-Man destroys it. In his own time, Kang falls for the princess of one of his subject kingdoms, Ravonna, who does not return his feelings. In an attempt to demonstrate his power, he kidnaps the Avengers and, after several escape attempts on their part, subdues them and the rebellious kingdom with the help of his army. When Kang refuses to execute Ravonna, his commanders revolt and he frees the Avengers to fight with him against them. They successfully subdue them, but not before Ravonna is mortally wounded when she leaps in front of a blast meant for Kang, realizing she does love him after all. Kang returns the Avengers to their present, and places Ravonna's body in stasis. In hopes of restoring his love to life, Kang enters a wager with the cosmic entity Grandmaster, using the Avengers as pawns in a game which, if won, can temporarily grant him power over life and death. The first round ends in stalemate when an unaware Black Knight intervenes and prevents a clear victory by the Avengers, although the team definitively wins the second round. Due to the first round's stalemate, Kang does not earn the power of both life and death but is forced to choose. He selects the power of death over the Avengers, but is stopped by the Black Knight, who, not being an Avenger at the time, is unaffected. Some time later Kang reappears at Avengers Mansion seeking the "Celestial Madonna", who turns out to be Mantis, desiring to marry her as she is apparently destined to have a powerful child. The heroes are aided by a future version of Kang, who, tired of conquest, had returned to ancient Egypt and his identity of Rama-Tut, ruling benevolently for ten years before placing himself in suspended animation to revive in the 20th century, desiring to counsel and change his younger self. While Kang is successfully foiled, Rama-Tut is unable to prevent the accidental death of the Avenger the Swordsman. During an adventure in Limbo, it is revealed that Immortus is the future incarnation of both Kang and Rama-Tut. While attempting to travel to the time of the Crusades, Hawkeye accidentally comes across Kang, sending both to the Old West. The warlord begins to develop a stronghold to conquer the 19th century, thus also conquering the present. Aided this time by Immortus, the Avengers, with some assistance from the Two-Gun Kid, confront Kang. While trying to muster the strength to defeat Thor, Kang overloads his armor and destroys himself, apparently erasing Immortus and Rama-Tut from existence. Years later, the Beyonder plucks a living Kang from the timestream to participate on the villains' side in the first of the Secret Wars. Soon after, it is revealed that while Kang had indeed died, his constant time-traveling had created a number of alternate Kangs. The Kang to discover this had been drawn to Limbo after his time-travel vehicle was destroyed by Thor. Finding Immortus' remains inside his fortress, Kang assumes the "Lord of Time" to be deceased and discovers the alternate versions of himself using viewing devices he finds, although he does not realize that Immortus is also a version of himself. At one point, he brings Ravonna to Limbo from the moment before her death, unintentionally creating an alternate reality where he was slain. Determined to be the only Kang, he joins with two particularly cunning divergents whom he determines he cannot easily eliminate, the three forming a council that systematically destroys the other alternate versions. He destroys one of the other two Kangs, then brings in the Avengers as part of a plot to destroy the other one, although the latter Kang eventually discovers the plot. This Kang is delayed by Ravonna, who tells him that if he truly loves her he must not kill the first Kang, but he ignores her, goes after him anyway, and is destroyed. Immortus then reveals he faked his death and manipulated everything from behind the scenes. Now only the one "Prime" Kang remains, who Immortus tricks into absorbing the memories of all the slain Kangs, which drives him insane. Immortus then sends the Avengers back to their own timeline. This Kang diverges into two alternate Kangs, and one is invited to join the Crosstime Kang Corps (or the "Council of Cross-Time Kangs"), which consists of a wide range of Kangs from multiple timelines who are searching for a Celestial "Ultimate Weapon". This Kang calls himself "Fred" (by his own admission a humorous nod to Fred Flintstone, with a prehistoric name being appropriate for a time-traveler) and has a brief encounter with the Avengers while trying to stop the female space-pirate Nebula from interfering with a timeline. The Prime Kang, having recovered, then attempts to manipulate the Avengers from a time vortex, and encounters the Fantastic Four in a bid to capture Mantis and use her to defeat a Celestial and the other Kangs, while "Fred" is incinerated by a Nebula-possessed Human Torch during a later battle with the Fantastic Four in the timestream. Later, the Prime Kang appears, captures the Vision, and battles both the Avengers and a new foe, Terminatrix, who is revealed to be a revived Ravonna. Kang is critically injured when he intercepts a blow from Thor's hammer Mjolnir that was meant for his old love, who is distraught over his sacrifice and teleports away with him. Terminatrix places Prime Kang in stasis to heal his injuries and assumes control of his empire. However, she finds the empire under attack by a chronal being called Alioth, and is forced to summon the Avengers to assist. She revives Kang, who assists the Avengers in defeating Alioth, but not before allowing the entity to kill the entire Crosstime Kang Corps. In Avengers Forever, flashbacks reveal that many of Kang's recent actions were motivated by more of a desire to do something rather than a genuine desire for power, Kang feeling listless and trapped by the burdens of the empire he has created. However, as he prepares to become Immortus, he glimpses the future and learns of Immortus's servitude to the Time Keepers, renewing his horror at the destiny that awaits him as that 'simpering academic'. As a result, Kang rejects this future to the point of aiding the Avengers in protecting Rick Jones from Immortus's latest scheme. When Immortus betrays the Time Keepers to try and save the Avengers, they kill him and attempt to turn Kang into Immortus. However, the temporal backlash of Kang's strength of will in a temporally unstable environment causes Immortus to split off from Kang, essentially making Immortus a clear alternate version of Kang rather than Kang's future. With the weakened Time Keepers destroyed, Kang rejoices in his freedom from the destiny of Immortus, as he has now technically become him while still being himself. After some months, Kang embarks on an ambitious scheme to conquer the Earth, this time aided by his son Marcus, who uses the "Scarlet Centurion" alias. Kang promises any who aid him on Earth a place in his new order, which puts Earth's defenses and the Avengers under strain as they fight off villain after villain. He then takes control of Earth's defense systems, and forces a surrender after destroying Washington, D.C., killing millions. The Avengers continue to battle the forces of Kang's new empire, and Captain America eventually defeats him in personal combat. Although imprisoned, Kang is freed by his son, revealed to be only one of a series of clones, and kills clone Marcus for betraying him by assisting Warbird during the invasion and keeping it secret despite multiple opportunities to admit the truth, before retreating from Earth. Kang travels the multi-verse and recruits Stryfe, Earth-X Venom (May "Mayday" Parker), Doom 2099, Iron Man 2020, Ahab, Magistrate Braddock, and Abomination Deathlok to save the multi-verse and possibly restore the universes that have already been erased. He appears to the remaining members of the Avengers Unity Squad after Earth has been destroyed by a Celestial leaving only the mutants, offering to help them save Earth by projecting their minds back into their past selves so that they can defeat the Celestial that attacked Earth, but subsequently attempts to steal its power for himself, requiring Sunfire and Havok to put themselves at risk by absorbing some of his energy themselves so that they can force him to expend his stolen power. Before the Inhuman king Black Bolt destroys the city of Attilan to release Terrigen Mist throughout the world, he sends his son Ahura away for Kang to foster. Black Bolt later releases a small amount of Terrigen Mist to activate Ahura's terrigenesis and activate his Inhuman ability. While Ahura is going through the change, Black Bolt asks Kang to save his son from the coming end of all things, which Kang agrees to on the condition that the son remain permanently in his care. While taunting the Inhumans' efforts to find Ahura, another Kang emerges under the alias of "Mister Gryphon", claiming that he has become splintered into various alternate versions of himself as a result of recent temporal disruptions. With this Kang confined to the present, he mounts a massive assault on the Avengers with the aid of Equinox and a reprogrammed Vision, intending to use Mjolnir's time-traveling ability to return to his era, but is defeated. When Vision abducts Kang's infant self in an attempt to defeat him, the latter, split into increasingly divergent versions of himself by the fractured state of time, retaliates by attacking various Avengers in their infant states. A possible future version of Kang saves key Avengers from his past self's attack by bringing them into Limbo until Hercules acquires an amulet from a former Fate that protects him from Kang's assault. During a battle inside a temple in Vietnam, the Wasp goes to place baby Kang back where he belongs. Kang is subsequently defeated. During the "Infinity Countdown" storyline, Kang the Conqueror gains knowledge of the calamity that would come if the Infinity Gems were to be gathered in the same location again. To prevent this from occurring, he abducts Adam Warlock, convinces him to help secure the Soul Gem in exchange for the Time Gem, and sends him back in time to receive counsel from Kang's Rama-Tut counterpart. 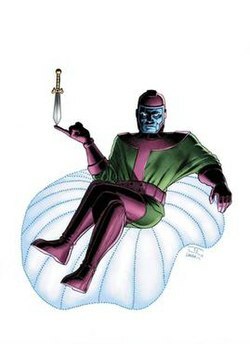 Immortus is an alternate version of Kang who resides in Limbo. Kang was destined to become him until the last issue of the Avengers Forever series, in which powerful beings called the Time Keepers unintentionally separate the former from the latter. Iron Lad is an adolescent version of Kang who learned of his future self when Kang tried to prevent a childhood hospitalization. Attempting to escape his destiny, the teen steals his future self's advanced armor and travels back to the past, forming the Young Avengers to help him stop Kang. When his attempt to reject his destiny results in Kang's death, the resulting destruction caused by the changes in history forces Iron Lad to return to his time and undo the damage by becoming Kang. Rama-Tut was Kang's original alias when he ruled ancient Egypt. Later in life, he retires as Kang and returns to the Rama-Tut identity, and helps the Avengers defeat his past self when he attempts to capture the "Celestial Madonna". He nearly surrenders to destiny to become Immortus, but changes his mind and returns to the Kang identity when he discovers that Immortus is a pawn of beings called the Time-Keepers. Kang has no superhuman abilities, but is an extraordinary genius, an expert historical scholar, and a master physicist (specializing in time travel), engineer, and technician. He is armed with 40th century technology, wearing highly advanced battle armor that enhances his strength; is capable of energy, hologram and force-field projection; has a 30-day supply of air and food, and is capable of controlling other forms of technology. Courtesy of his "time-ship", Kang has access to technology from any century, and he once claimed his ship alone could destroy the Moon. [volume & issue needed] He is also far more resistant to radiation than humans from the present. As Rama-Tut, he used an "ultra-diode" ray gun that was able to sap the wills of human beings. At a high frequency, it is able to weaken superhuman beings and prevent use of their superpowers. They can be freed from its effects if the gun is fired at them a second time. The Spider-Ham reality contains a kangaroo named Kangaroo the Conqueror. Kang and Mantis hide out in Peru, where they plot their revenge against the Avengers. This plot would never come to fruition, as Loki absorbs the two in his bid to take over the Earth. [volume & issue needed] Loki is ultimately defeated, and while many of the super-beings that he absorbed are seen active following the battle, Kang's ultimate fate is not depicted. A female version of Kang appears in the Ultimate universe, claiming she has a plan to prevent the destruction of Earth. She recruits Quicksilver, the Hulk and Reed Richards as part of a plan to steal the Infinity Gauntlets, and destroys the Triskelion in the process. Kang eventually reveals that she is Sue Storm. An alternate version of Kang who retained the "Scarlet Centurion" identity is depicted as having taken over the future of the Squadron Supreme's universe. Spider-Geddon, a sequel to the Spider-Verse storyline, features a version of Kang called Kang the Conglomerator, a businessman from the year 2099 who wants to take Spider-Punk into the future to take control of his franchise because of his marketability. Spider-Punk fights Kang along with Captain Anarchy and the Hulk. Kang is defeated and disappears, but not before mentioning that Spider-Punk will die young while Captain Anarchy will die an old man. Rama-Tut appears in the 1967 Fantastic Four episode "Rama-Tut", voiced by Mike Road. Kang the Conqueror appears in The Avengers: United They Stand episode "Kang", voiced by Ken Kramer. In the 41st century, Kang is a cruel tyrant, oppressing billions. Eventually, a revolution defeats him and his forces, and he is imprisoned within dimensions, an obelisk his only means of escape. After Kang is accidentally freed he battles the Avengers, rapidly ages New Yorkers and Tigra, and attacks Avengers mansion. Ultimately, Ant-Man tricks Kang into taking a bomb attached to the obelisk. The explosion leaves Kang permanently trapped in his prison. Rama-Tut has an unvoiced cameo in X-Men: Evolution during Apocalypse's origins. Kang appears in several episodes of the Avengers Assemble animated series, voiced by Steven Blum. In the episode "The Conqueror", his future technology ends up the hands of villains such as Whiplash and A.I.M.. When Iron Man accidentally ends up in Kang's time, the two briefly struggle before returning to the present. Kang later returns with his ship the Damocles as the Avengers work to prevent it from firing a mega-cannon that would annihilate Manhattan. Although the Avengers disable the cannon, Kang takes the ship, and most of the Avengers, back to the 30th century. In the episode "Into the Future", the Avengers meet a future Thor, Black Widow, and several rebels who help fight Kang and his Kangbots. In the two-part episode "Avengers No More", Kang appears as a member of the second incarnation of the Cabal, assisting the Leader in his plot to scatter the Avengers across time and space. Kang is featured as a boss and unlockable playable character in the Facebook game Marvel: Avengers Alliance. Kang is featured as a boss and antagonist in Kabam's Marvel: Contest of Champions. Kang is featured as the central focus and a playable character in Lego Marvel Super Heroes 2, voiced by Peter Serafinowicz. He captures specific locations in time and space to form Chronopolis, and tricks the Avengers into defeating Man-Thing so he can bomb the Nexus of All Realities. During the final battle, Captain America defeats Kang, and Ravonna uses his time crystal to regress him to an infant. In the mid-credits scene, he plays with a flying sword, and babbles, "Kang." In the post-credits, an elderly Kang is seen with Ravonna, Cosmo the Spacedog, Man-Thing, and the Supreme Intelligence when they appear in Manhattan to warn Captain America, Captain Marvel, and Iron Man of a new threat. The band Ookla the Mok devoted a song to Kang in their 2013 album "vs. Evil". ^ Kang the Conqueror is number 65, IGN. ^ Edge of Spider-Geddon #1. Marvel Comics. ^ "Twitter / Christopher Yost: @VenomMelendez Maria Hill". Twitter.com. Retrieved 2010-12-28. ^ Ching, Albert (1 June 2015). "'Ultimate Spider-Man' And 'Avengers' Renewed On Disney XD With New Titles". ComicBookResources.com. Retrieved 14 July 2015. ^ "The Conqueror". Avengers: Ultron Revolution. Season 3. Episode 12. August 14, 2016. ^ "Lego Marvel Super Heroes 2 coming to PC, PS4, Switch, Xbox One". Polygon. 15 May 2017. Retrieved 16 May 2017.